Take a stroll through history in a most horrible way. 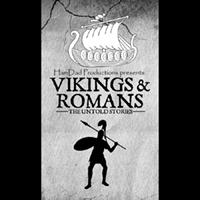 Adapted from the CBBC show Horrible Histories and the books by Terry Deary, join us as we raid and pillage with Vicious Vikings and battle lions with Rotten Romans. This hilarious sketch comedy is sure to have the whole family in stitches. It seems that two companies this year had the exact same idea. Take the popular children’s book series Horrible Histories by Terry Deary and turn them into an hour of sketch comedy. This is a fantastic place to start for a script. Unfortunately this adaptation missed the mark. It felt like I was watching an early rehearsal for a fringe play. The costumes were street clothes with towels for togas. The props were Dollarama schlock. The set changes were long and had no music. Worst of all there was so much talking backstage and frantic running that I could tell things were going horrifically bad. The cast was clearly very new to acting, with the exception of two actors. I felt bad because these two had to over compensate for the lack luster performance of the others. Better luck next year folks.